we use these for kitchen cabinets they are great and sturdy. has a nice clean finish and look very sleek, we use against white cabinets. and gray. 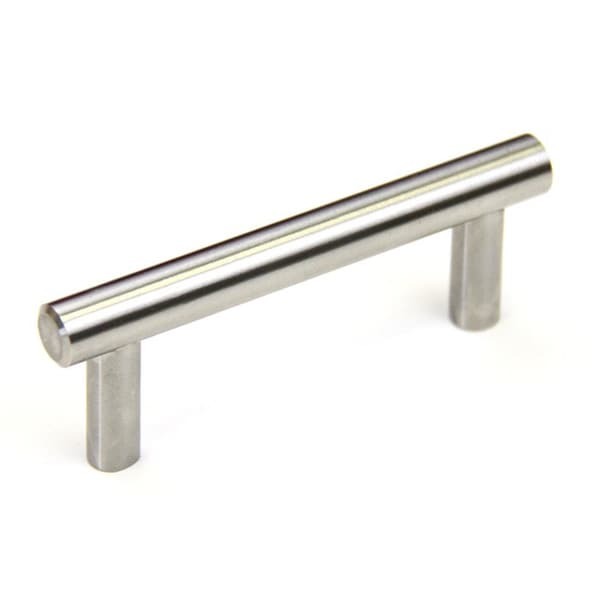 These brushed nickel pull handles will add contemporary style to your kitchen or bathroom decor. Includes a set of 25 stainless steel bar shaped handles so that you can create a cohesive look in any room. The sleek design will complement contemporary and modern styles elegantly, and includes all hardware for easy installation. I just love the finds on Overstock! These handles are sold at an upscale retailer for 3 times the cost I paid for them. They look fantastic in my new kitchen, great transitional style appeal. When I first received these handles, I wasn't sure whether I would use them or not. When they were actually installed I love them. Very surprised....the price was great so I didn't expect the high quality. They have a nice weight and feel. Large enough to get a good grip when opening a drawer/cabinet and they are finished with no rough edges. The sizes do very slightly, so be prepared for a little adjusting. Purchased these for a kitchen remodel. Perfect size for doors. A must buy. These were the frosting on the cake for my kitchen remodel! I used a black for cabinets and this hardware was just the perfect choice to update my kitchen. They came quickly and were exactly as ordered. My cabinet doors are thick so I needed a longer screw. Buyers may want to know this comes with a metric screw that is an M4 and about an inch long. I needed ones that were at least 1.5 inches and since it was metric I found them only in small amts. at auto sections of big box stores. I ended up ordering 88 of them from Fastenells for about $12 and got washers to adjust length. It was a small price to make it all work as these are solid modern handles that are a stellar price and worked well in my project. I highly recommend this site for products and good service. I wish they had listed the screw size and length. I am going to order other handles from them for my next project. I have gotten high reviews from visitors to my kitchen. I highly recommend this product just realize you may need to find replacement screws if you have thick cupboard doors like I do. Great pulls, but off in the measurements! I replaced my previous pulls with these stainless steel ones. They are really nice and sturdy...however, I am only rating a 3 because we measured and selected the precise measurement we needed. When we got them and took off our old pulls, we had to drill into the drawers because they were off by 1/8 of an inch...not enough to add a new hole, but enough that we had to "widen" the holes we already had. That part was disappointing. Note, this isn't a measurement error on our part, it is a manufacturer misrepresentation. Its not a huge deal, I am not a super fussy person, but it was noteworthy to me. If you have are adding new pulls altogether, this shouldn't be an issue to you. Great looking pulls though! Poor quality control BUT not bad drawer pulls for the money. I ordered two cases and had 11 that were not usable. 1had bad finish on it and the others the 3" spacing on the mounts was of by 1/16 to 1/8 of an inch. Overstock sent another box and I was able to get 50 good handles out of three cases. They are nice looking and solid handles. Even with all the problems I would buy them again. Christy in customer service handled things promptly and courteously. I love the clean contemporary look and feel of these handles. Order was sent promptly and they were easy to install so I would definitely recommend. Decent product, some different sizes. I really like the look of these pulls on my dark kitchen cabinets, but about 10 of the pulls were smaller than the others. I had to adjust my holes in my cabinets to fit the small pulls. Make sure you check the length of the holes before you drill. Even a small degree off can mean your pull won't screw on correctly. nice quality. cross bar is not as long as others which is just what I needed as handles with longer extension from the mount would hit each other when closed. Nice quality heavy cabinet pulls. As others have said, the spacing is a little off on most and not quite 3". We adjusted our measurements and they worked great and look really nice. Needed quite a few door handles for our kitchen. A great price and great quality for this product. The look is great especially for the price! It's a great value for the price. They look great. We installed them in our renovated kitchen and they look great. "I only need 32 of the 4" stainless steel pulls. Is there a way I can buy that many only?" We do apologize, we do not currently offer this item at this time. "How far spaced are the screw holes? I am replacing my pulls and old ones are 3 inches apart." Hello barbnroy, the hole to hole spacing is approximately 3 inches. Thanks for shopping with us! "What is the return policy on this product?" Hello Dudley, this item can be returned in new or unused condition within 30 days of delivery for a full refund. Please let us know if you have additional questions. Thanks for shopping with us. "I am looking for offset hinges 0.375 to match these cabinet pulls"
Hello sheilarae, item # 13816957 is a great match for these pulls. Thank you for shopping with us! I needed a stainless or chrome look for pre drilled holes. "What is the grade of Stainless Steel of these pulls? It states 100% SS, but Brushed Nickel finish - does this mean there is a Nickel overlay on top of the SS? Thanks." Hello nycgirl523, the stainless steel is true 202 Grade stainless steel. The finished of the stainless steel is brushed stainless steel. Thanks for shopping with us!